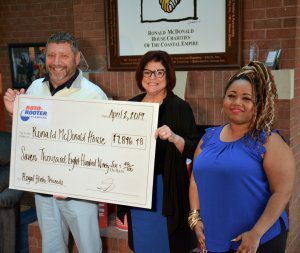 (SAVANNAH, GA) Roto-Rooter Plumbers of Savannah presented $7,896.48 to the Ronald McDonald House of the Coastal Empire to support their mission to provide a restful, comfortable place for children and their families to find refuge and support as they receive medical treatment at nearby hospitals. Bill Sorochak, executive director of Ronald McDonald House, praised the contribution. Ronald McDonald House Charities of the Coastal Empire is a registered 501©3 non-profit that operates solely on donations. The cornerstone program is the Savannah Ronald McDonald House that provides more than 4,170 family night stays each year with a “Home away from home.” Other core programs include the Ronald McDonald Family Rooms in St. Joseph’s/Candler Hospital and the Dwaine & Cynthia Willett Children’s Hospital at Memorial Hospital Medical Center and the Ronald McDonald Care Mobile, a mobile dental clinic providing free dental cleanings and examinations, care to underserved, school-aged children in Beaufort County, S.C.